Boston, MA (AHN) - The wife of an American soldier who has been missing in Iraq for more than a month could face deportation. According to officials, Yaderlin Hiraldo, wife of Army specialist Alex Jimenez, entered the U.S. illegally from the Dominican Republic in 2001 and should now leave the country and stay there for at least 10 years before she becomes eligible for a green card. "I can't imagine a bigger injustice than that, to be deporting someone's wife who is fighting and possibly dying for our country," Yaderlin's attorney, Matthew Kolken told the Boston's WBZ-TV. As Yaderlin Hiraldo worries about whether or not her soldier husband has perished in Iraq federal immigration officials are setting about deporting the woman back to her home country. Hiraldo’s husband is U.S. Army Specialist Alex Jimenez, one of the soldiers still missing after a May 12th insurgent attack near Baghdad. 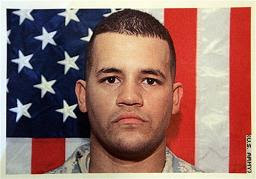 Jimenez and another soldier are officially listed as missing in action after the attack that claimed four more soldiers’ lives.